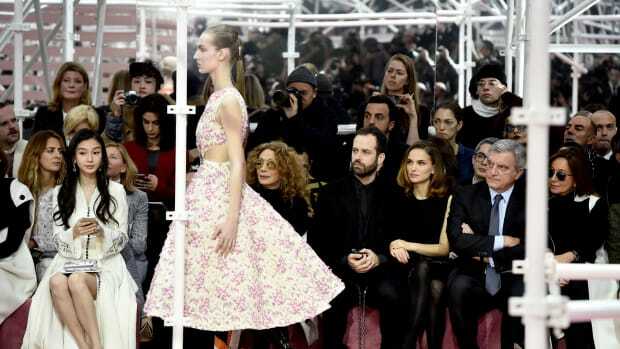 In his fourth haute couture collection for Dior, Raf Simons eschewed the more sumptuous settings he had constructed in seasons past and instead showed the house&apos;s Spring 2014 collection in a tiny cave. The small, private space emphasized the very root of the collection: the private relationship of a woman to couture, in particular her relationship to Dior couture. “The emotional experience of couture -- the relationship between the clients, the salon and the women,” said Simons when addressing the collection. Emotional indeed -- the incredible and difficult handiwork that went into the looks was breathtaking, and one could easily see why, even though it&apos;s a luxury very few people can afford, couture continues to cast a spell. See an ivory silk strapless dress with cutouts and side panels, concealing layers of embroidered vivid green flowers. As the models passed, these intricately beaded fauna shined through the porous fabric just so, creating a quietly dramatic moment that just pulled on the heart strings. Simons took craftsmanship to new levels here. The dazzling display of the aforementioned intricate cutouts, as seen throughout the collection, epitomized the level of talent at the Dior atelier. Fabrics like organza and wool were delicately spliced for a peekaboo effect, which worked especially well on a navy silk dress that revealed a bit of flesh, as well as on a riff of the house&apos;s iconic "bar" jacket, this time in white, that exposed bits of the navy jumpsuit underneath. Another outstanding (though perhaps less laborious) look: a simple white embroidered tank and A-line short skirt. But beyond the clothes, another conversation was happening here -- one that related back to Simons&apos; creative concept of revisiting the foundations of couture and the client relationships it fosters. While the embroidered ink blue jacket with flared sleeves and wool pants may be perfectly client-ready, who&apos;s buying? 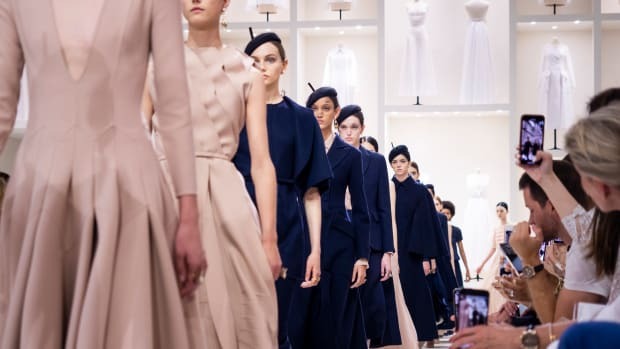 Well, Dior has been on an active mission to export couture overseas, particularly in strategic growth regions where new and younger clients can be found. In the two past years, the brand has been staging entire couture shows in Shanghai, where the atelier can dispatch its expert hands to cater to the local market. Intimacy is also an important currency in the extreme luxury space, as wealthy patrons are now seeking products that are less ostentatious and recognizable. So, then, it looks like Raf Simons is not only the house&apos;s creative director, but an important business mind behind the brand as well. At least one of these dresses is making it to the Academy Awards. Maria Grazia Chiuri's latest showing for the brand was a lovely display of simplicity, femininity and classic elegance, with a modern twist on house codes.